If heat could ‘freeze’ things in place, it did this day at Joggins. 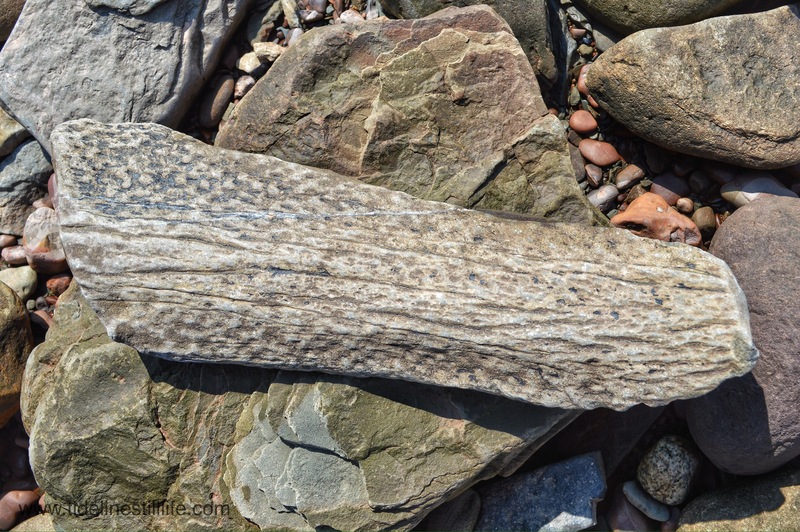 Lycopsid trunk tossed onto the tide line at Joggins Fossil Cliffs, Bay of Fundy, Nova Scotia. 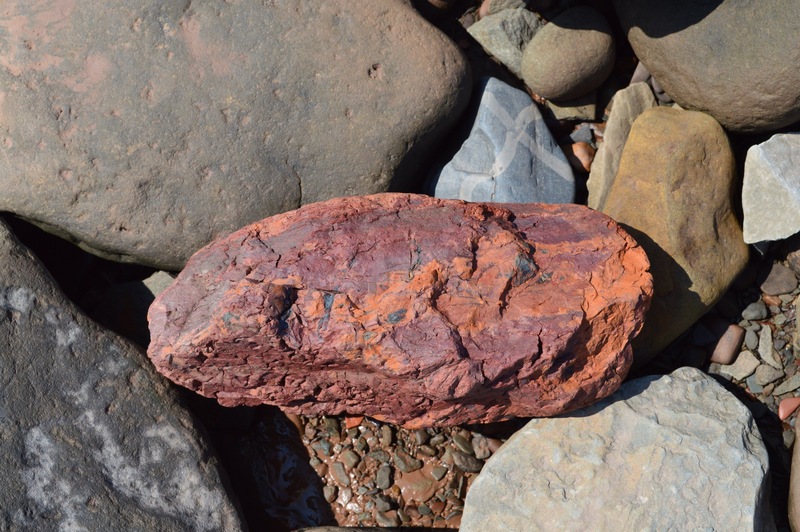 Scattered here and there on the beach at Joggins Fossil Cliffs are brilliant red and orange rocks. These rocks were apparently burned in a fire in the coal mine (closed in 1958), and have since washed out of the mine. While the rocks and the day’s snail trails are certainly not fossils, they do make an interesting tide line composition. A note: the colors have not been enhanced at all in the photos. 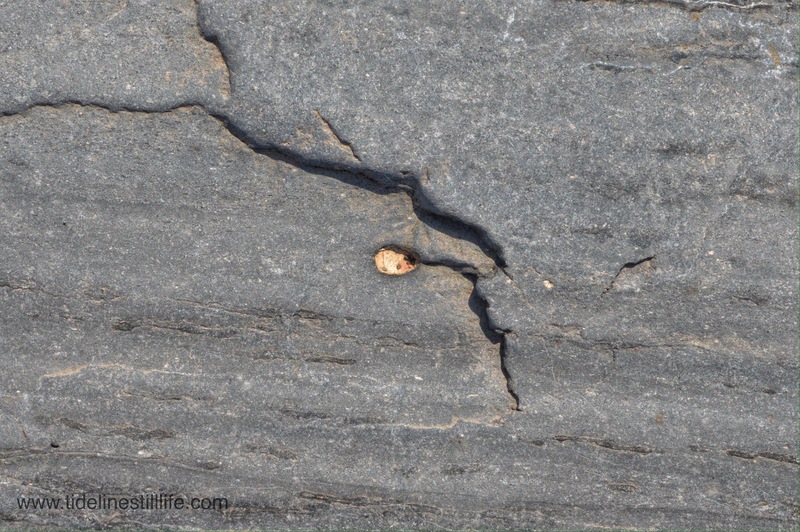 Here is another scorched rock from right along the tide line. 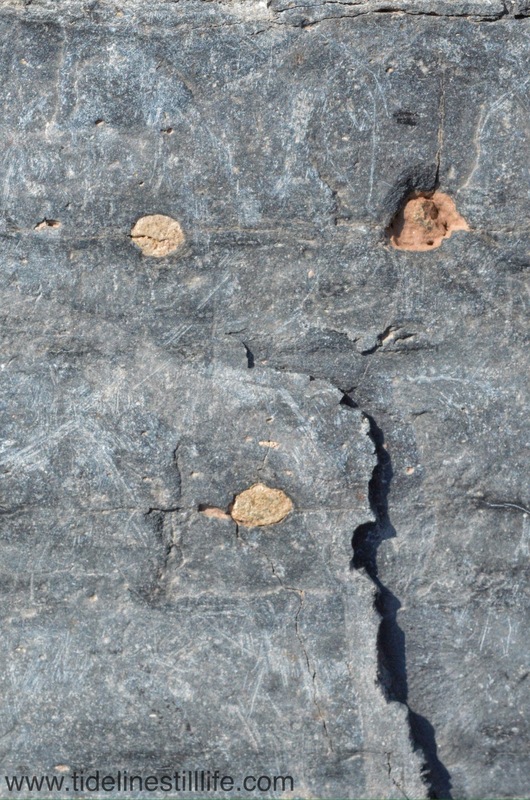 Three bits of coprolite are visible here, along with many scrape marks. 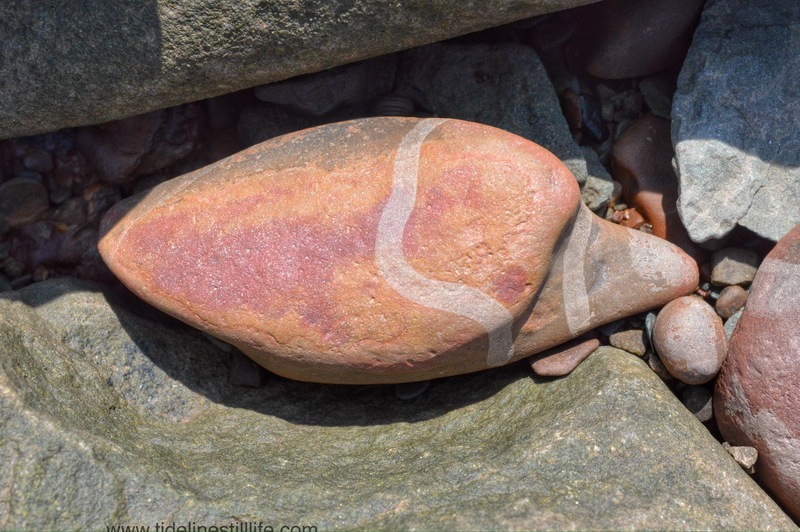 These etchings in the surface of the rocks are caused by the power of the tides tossing rocks upon rocks. 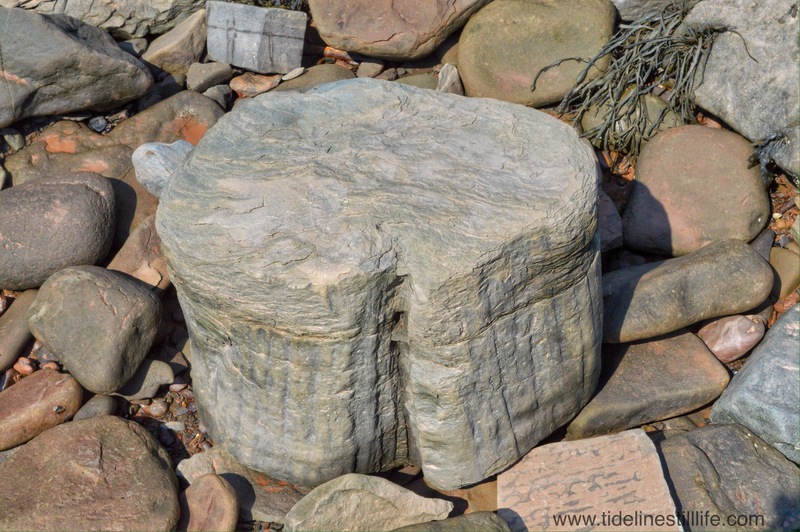 The tides on the Bay of Fundy are fierce! 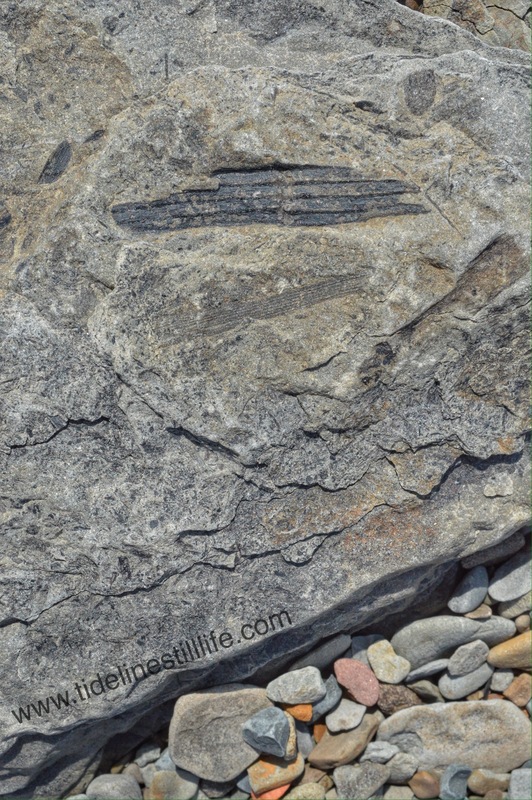 In this case, the tide line receded to reveal this composition with shale, small crevasses, and coprolite … fossilized fish poop! Yes, the type A in me had a very difficult time not maneuvering the pebbles to make a straight line. Lepidodendron (Carboniferous Period, approx. 310-325 million years ago). Small rounded granite stones that must predate the fossil, based on the amount of erosion. A still life window into eons past, taken in the very present, and published on the internet, where it should last for quite some time in the future. Isn’t time amazing? 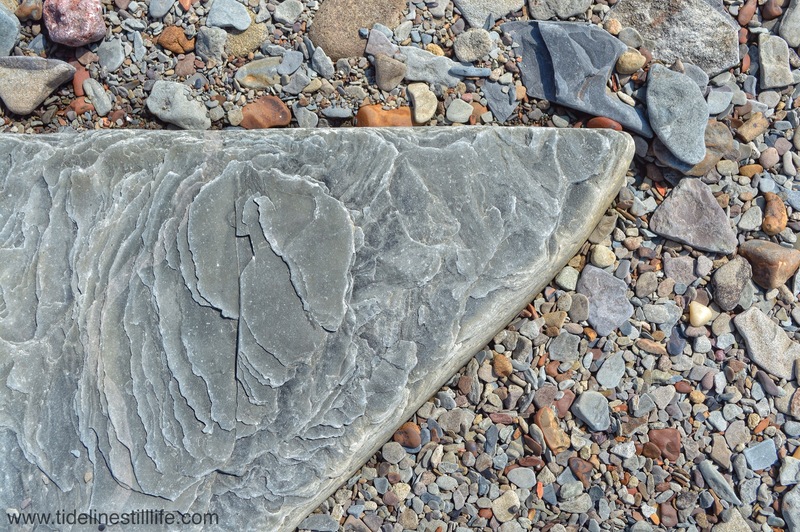 It is a different sort of tide line that presents itself at Joggins Fossil Cliffs, and other pebble beaches. 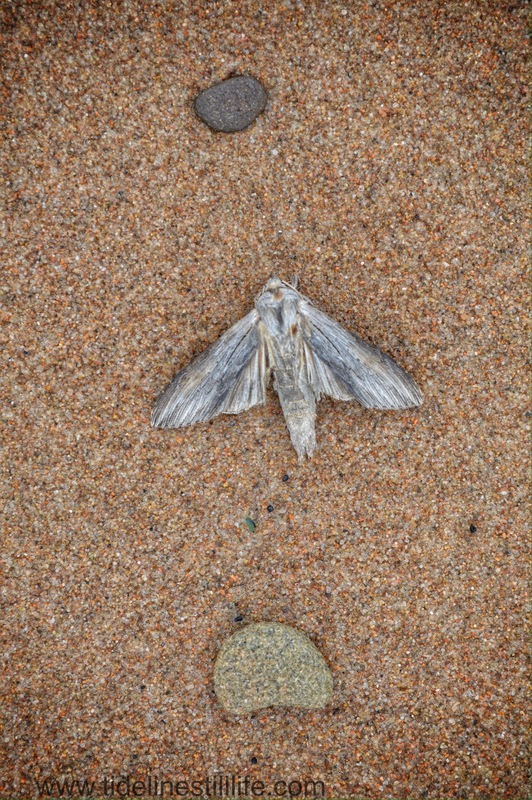 Where I usually look for compositions that prominently include marine life (plant and/or animal) on a sand background, pebble beaches do not offer this sort of tableau. 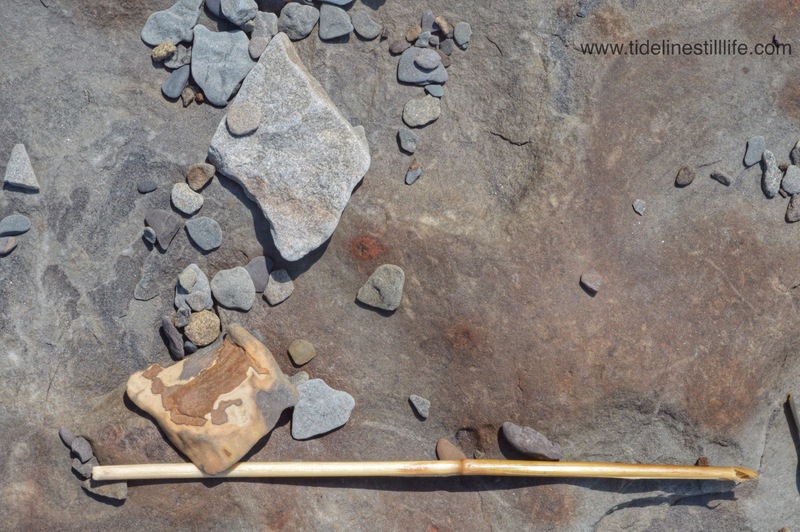 Instead, a pebble-beach tide line is a puzzle of shapes and textures that almost require a refocusing of one’s eye and thoughts before focusing a camera lens. Joggins is an evolving, shifting beach because of the constant erosion of the cliffs, coupled with dramatic high tides. The result is a beach (and tideline) that is littered with new-fallen shale, as well as with stones and pebbles that are well eroded. New fossils are revealed with every new cliff-fall, and can easily be found in many of the eroded stones. 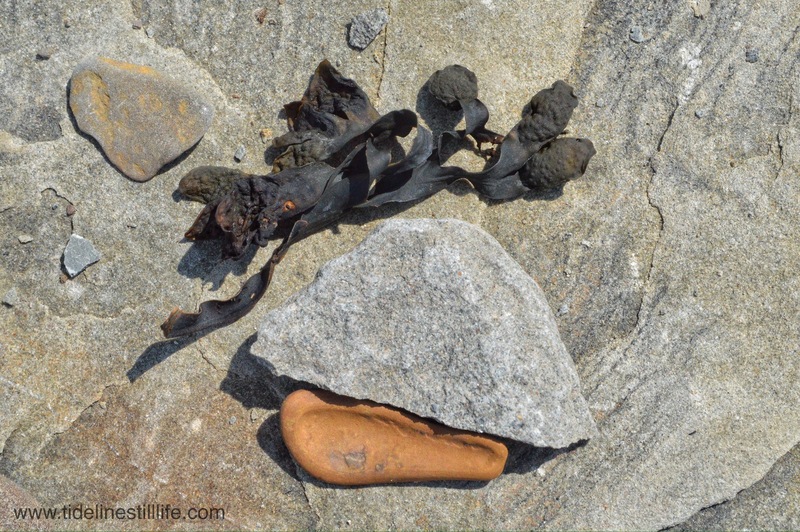 This still life does not have any fossils that I can see, but the textures and colors in the shale and stones create a pleasing and somewhat dynamic photograph. I notice new things about it every time I look at it.